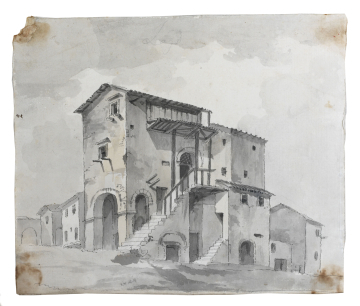 You are here: CollectionsOnline / Italy: unidentified location. View of a part of village street with a rustic house on arches with an outside staircase to a wooden balcony or landing. This may be the same house that appears in the background of Adam vol.57/4, a view which is also inscribed 'Lago', as are Adam vol. 57/3, 5, 7, 8 and 9. It is possible that they all represent the domestic architecture of the small port of Pozzuoli, a panoramic view of which is found in Paoli's Avanzi Delle Antichita Esistenti a Pozzuoli Cuma e Baja, Naples, 1768, Tab.IV. The inscription could refer to several of the notable lakes west of Naples, such as Averno or Fusaro, both of which Robert Adam visited. It might equally refer to the Lago d'Agnano, which was not drained until 1870. On the south bank of the latter was the Grotta del Cane, which Adam visited and described thus in a letter of 8th April: 'a small cave from the ground of which there issues a sulphurous flame which at once destroys any animal who is forced into it.' (J. Fleming, Robert Adam and his Circle in Edinburgh & Rome, London, 1962, p.154). 'Lago' might also refer to the Lago Fucino, which Adam may have visited on his return to Rome via Cassino.